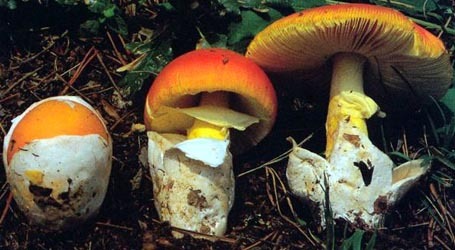 english name "Jackson's Slender Caesar"
=Amanita tullossii Guzmán & Ram.-Guill. 1. Amanita jacksonii, Schenectady Co., New York, U.S.A.
2. Amanita jacksonii, Schenectady Co., New York, U.S.A.
Amanita jacksonii has a brilliant red cap, 80 - 120 mm wide with an umbo and marginal striations taking up 40 - 50% of the radius. The red pigment fades from margin toward the center with age. The gills are free to narrowly adnate, moderately crowded to crowded, orange-yellow to yellow-orange to yellow. The short gills are subtruncate to truncate. The stem (90 - 140 × 9 - 16 mm) is yellow and is decorated with orange fibrils and patches that are the remnants of a felted extension of the limbus internus of the otherwise white volva. 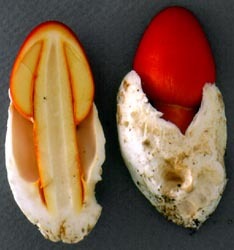 In the center photo, a piece of the orange, felted material failed to separate from the margin of the yellow-orange annulus and is being peeled up the stem surface. The volval sac is 40 - 70 mm high and up to 4 mm thick at its midheight. The spores measure (7.0-) 7.8 - 9.8 (-12.1) × (5.2-) 5.8 - 7.5 (-8.7) µm and are broadly ellipsoid to ellipsoid (rarely subglobose or elongate) and inamyloid. Clamps are common at bases of basidia. The species occurs with oak and pine. In Hidalgo, the species occurs in cloud forest of pine. The range of this species extends from the Province of Quebec, Canada at least to the State of Hidalgo, Mexico. The photograph in figure 92 of Guzmán and Ramírez-Guillén (2001) shows what appears to be A. jacksonii being sold in a public market in Guatemala. Other Western Hemisphere species whose ranges overlap that of A. jacksonii in the "Slender Caesar group" include A. arkansana H. R. Rosen, A. banningiana Tulloss nom. prov., and A. murrilliana Singer. In the US, A. jacksonii may be found throughout appropriate habitat east of the Great Plains. author Pomerl. 1984. Naturaliste Canad. 111: 329. ≡Amanita umbonata Pomerl. 1980. Fl. champ. Québec: 516; pl. 110, fig. 1; pl. XXXVIII, figs. 1-3, 5.
non Amanita umbonata (Sumst.) Sartory & L. Maire. 1923. Compend. Hymenomyc.—Amanita 17: 374. ≡Vaginata umbonata Sumst. 1914. Mycologia 6: 35, pl. 117, fig. 1. ≡Armillaria umbonata (Sumst.) Murrill. 1914a. N. Amer. Fl. 10: 38. ≡Amanitopsis umbonata (Sumst.) Sacc. & Trotter. 1925. Syll. Fung. 23(10): 5. ≡Squamanita umbonata (Sumst.) Bas. 1965. Persoonia 3: 334. =Amanita tullossii Guzmán & Ram.-Guill. 2001. Biblioth. Mycol. 187: 33, figs. 3, 72-79, 98, 99. =Amanita caesarea sensu auct. amer. non Amanita caesarea (Scop. : Fr.) Pers. 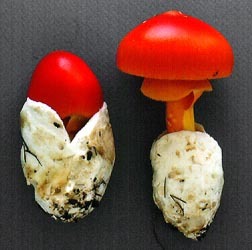 holotypes Amanita jacksonii—QFB. A. tullossii—FCME; isotype, XAL. selected illustrations Tulloss. 2000a. Boll. Gruppo Micol. G. Bresadola 43(2): 16 (fig. 5), 44 (fig. 2). The following is based upon original research by R. E. Tulloss. pileus 80 - 112 mm wide, brilliant red to red-orange over disk [with no color sufficiently brilliant to match this in Kornerup & Wanscher (1978)], orange-red to orange over striae, at times with yellow context exposed in striae, in age becoming dull and picking up brown tints especially on umbo, convex to planoconvex, umbonate, viscid when moist, then tacky, subshiny to shiny; context pale yellow or yellowish white, deeper color in umbo [e.g., orange to orange-yellow (4A5) to yellow] and below pileipellis and just above lamellae, unchanging when cut or bruised, 5.5 - 9 mm thick, thinning evenly for about one half to three-quarters radius, then membranous to margin; margin striate (0.4R - 0.45R), nonappendiculate; universal veil usually absent, occasionally as thick cottony white calyptra; pileipellis rather thick. lamellae free to narrowly adnate, some with short decurrent tooth, sometimes with short decurrent line on stipe apex, subcrowded to crowded, orange-yellow to yellow-orange to yellow (e.g., 2A3-4) in mass, pale yellow to yellow (3A3-4) in side view, unchanging when cut or bruised, 5 - 14 mm broad, broadest about three-quarters of distance from stipe toward margin, with minute orange flocculence on edges; lamellulae subtruncate to truncate, unevenly distributed, of diverse lengths, plentiful. stipe 90 - 144 × 9.5 - 15.5 mm, yellow (e.g., 4A4) to orange-yellow, sometimes pale orange-yellow (e.g., 5A4) above partial veil and then concolorous with upper surface of partial veil, narrowing upward, flaring just at apex or not at all, unchanging when cut or bruised, with cracking or splitting orangy-pink to yellow-orange (e.g., close to 5A5) to orange (sometimes concolorous with partial veil) felted covering (becoming deep orange to orange-red and deposited in fibrillose to felted strips or irregular patches with age), narrowing upward, barely flaring at apex, longitudinally striatulate below partial veil, pruinose to pulverulent above partial veil; context stuffed to hollow, pale yellowish white except more intensely yellow (e.g., 3A3-4) near surface or near base or near pileus context, unchanging when cut or bruised, brownish in old larva tunnels in bottom of volva, with loosely interwoven white fibrils (often distinctly longitudinally oriented) filling central cylinder or with fibrillose to glutinous cross-walls in central cylinder, with central cylinder 4.5 - 9 mm wide; partial veil superior, membranous, with thickened margin, 6A4-5 or slightly grayer than 5A4 or paler above, concolorous or more reddish orange (e.g., 7A6-8) below, sometimes more yellow on portions near edge, striate above, smooth below, with edge sometimes remaining attached to lower end of stipe’s felted covering [latter then drawn up and peeled off stipe by stipe expansion], with edge sometimes thickened; universal veil as saccate volva, often with two lobes, white, soft, cottony on exterior, rather tough, top of limb reaching 43 - 70 mm from stipe base, 26- - 30+ mm wide, rather thick (2 - 4 mm at midpoint between upper tip of limb and point of attachment to stipe), having small concolorous limbus internus very close to point of attachment (at very base of stipe), with uppermost part or inner surface (sometimes both surfaces) of limbus internus orange (concolorous with patches on stipe). odor/taste Odor not discernible. Taste not recorded. tests Spot test for laccase (syringaldazine): negative throughout basidiome. Spot test for tyrosinase (L-tyrosine): positive in scattered areas of one or more of the following: disk, surfaces of central cylinder of stipe, surface of stipe, cut edges of lamellae, and surfaces of volva; with reaction much reduced in older material. Test vouchers: Tulloss 8-18-86-D, 7-18-96-A. lamella trama bilateral, with angle of divergence shallow; wcs = 40 - 45 µm; filamentous undifferentiated hyphae 2.2 - 10.0 µm wide, branching, with intercalary inflated cells up to 162 × 24 µm in subhymenial base diverging at a shallow angle and curving to an angle of about 60° to central stratum; terminal, divergent inflated cells not observed; vascular hyphae 2.8 - 11.2 µm, branching, scattered; clamps present. subhymenium wst-near = 45 - 65 µm; wst-far = 65 - 75 µm; cellular, 2 - 3 cells deep below bases of longest basidia/-oles, 10 - 15 µm between subhymenial base and base of nearest basidium, with cells having major axis ? ?, with basidia arising from inflated cells, with one cell between bases of longest and shortest basidium/-ole in a narrow region. basidia (18-) 28 - 51 × 8.5 - 12.8 µm, thin-walled, clavate to broadly subfusiform, 4-sterigmate, with sterigmata up to ? × ? µm; clamps relatively common, prominent. [337/16/12] (7.0-) 7.8 - 10.1 (-13.0) × (5.2-) 6.0 - 7.5 (-8.7) µm, (L = (8.1-) 8.4 - 9.5 (-10.0) µm; L’ = 8.9 µm; W = (6.0-) 6.3 - 7.1 (-7.3) µm; W’ = 6.7 µm; Q = (1.11-) 1.20 - 1.53 (-1.63); Q = 1.25 - 1.42 (-1.47); Q’ = 1.33), hyaline, colorless, smooth, thin-walled, inamyloid, broadly ellipsoid to ellipsoid, infrequently subglobose, infrequently “giant” or misshapen; apiculus sublateral, at times relatively broad, cylindric; contents dominantly monoguttulate, occasionally with additional small granules; white in deposit. ecology Solitary to subgregarious. Prov. Québec: In young Quercus forest. Hidalgo edo. : Under Pinus patula in cloud (mesophytic) forest of Pinus and Quercus. Maine: Under Carpinus caroliniana, with Hamamelis virginiana in understory. Connecticut: In mixed or pure conifer forests. Massachusetts: In mixed forest. New York: In moist, mostly deciduous woods including Carya sp., Carpinus caroliniana, P. strobus, Q. coccinea, Viburnum recognitum, etc. North Carolina: 855 - 1050 m elev. material examined CANADA: QUÉBEC—Région Capitale-Nationale - Québec, 22.vii.1951 R. Pomerleau s.n. (holotype, QFB 11271); ca. Québec, vii.1951 R. Pomerleau s.n. (DAOM 84885). MÉXICO: HIDALGO—Mpio. Zacualtipan - ca. northern jct. of México Carretera Federal 105 deviation for Zacualtipan & main México Carretera Federal 105 [20°40’28”N/98°40’29”W], 18.vii.1995 Arturo Estrada Torres s.n. [Tulloss 7-18-96-A] (RET 252-9; TLXM). U.S.A.: CONNECTICUT—Middlesex Co. - Devil's Hopyard St. Pk. [41°28’32” N/ 72°20’25” W, 72 m], 4.ix.2011 Djerba Goldfinger s.n. [Tulloss 9-4-11-L] (RET 489-5). New London Co. - Day Pond St. Pk. [41°33'25" N/ 72°25'06" W, 134 m], 25.ix.1999 Jeanne Jones s.n. [RET 9-25-99-O] (RET 301-6). Tolland Co. - Gay City St. Pk. [41°43’23” N/ 72°26’38” W, 209 m], 31.viii.1997 Jura Strimaitis s.n. [Tulloss 8-31-97-B] (RET 267-6; XAL). Unkn. Co. - NEMF 2000, Walk 4, 11.viii.2000 Charlotte Carlson s.n. [Tulloss 8-11-00-A] (RET 315-8). Unkn. Co. - NEMF 2000, Walk 11, 11.viii.2000 Ralph Cox s.n. [Tulloss 8-11-00-E] (RET 315-9). INDIANA—Lawrence Co. - Lake Monroe, Deam Wilderness [38.9762° N/ 86.3518° W, 210 m], 1.ix.2012 Stephen Russell s.n. [mushroomobserver #109414] (RET 531-4). MAINE—Unkn. co. - "southern Maine," 16.vii.1984 S. S. Ristich s.n. [Tulloss 7-16-85-SSR-A] (MEXU 23452; RET 044-8; XAL). MASSACHUSETTS—Franklin Co. - Mohawk Tr. St. For., 16.viii.1981 M. A. King & R. E. Tulloss 8-16-81-H (RET 109-4; XAL). MISSOURI—Ste. Genevieve Co. - W of Ste. Genevieve, Hawn St. Pk. [37.8337° N/ 90.2416° W, 262 m], 27.ix.2010 Patrick G. Harvey s.n. (RET 453-1). NEW YORK—Schenectady Co. - Mariaville, M. A. King, J. & W. Somers & R. E. Tulloss [Tulloss 8-18-86-D] (in herb. C. Lavorato; RET 027-4; XAL), [Tulloss 8-18-86-F] (RET 079-8). Ulster Co. - Olive Twp., South Hollow, 20.viii.1994 participant NEMF1994 s.n. [Tulloss 8-20-94-D] (RET 154-10). Warren Co. - Warrensburg, Pack For., 2.vii.1996 Sandy Sheine s.n. (RET 251-2), viii.1996 Sandy Sheine s.n. (RET 251-1). NORTH CAROLINA—Haywood Co. - GSMNP, Cataloochee Valley, Rough Fork Tr., ca. old house [35°35.9’ N/ 83°08.0’ W], 13.vii.1999 R. E. Tulloss 7-31-99-A [ATBI FU-0223] (RET 393-7); GSMNP, Cataloochee Valley [35°37.2’ N/ 83°07.1’ W], 9.vii.1999 G. Sheine s.n. [ATBI FU-0150] (RET 393-8); GSMNP, Little Cataloochee Tr. [35°38.3’ N/ 83°07.3’ W, 900+ m], 11.vii.1999 E. Rothberger s.n. [ATBI FU-0223] (RET 393-6, juvenilis). PENNSYLVANIA—Carbon Co. - Hickory Run St. Pk. [41.0333° N/ 75.6920° W, 400-500 m], 12.viii.2012 David Wasiliewski s.n. [mushroomobserver #105177] (RET 526-5). Erie Co. - Erie [42.0858° N/ 80.1164° W, 182 m], 5.vii.2013 "A. J." s.n. [mushroomobserver #138694] (RET 547-4). Luzerne Co. - Ricketts Glen St. Pk. [41.3036° N/ 76.2740° W, 400-600 m], 14.vii.2013 D. Wasiliewski s.n. [mushroomobserver #140111] (RET 551-6). TENNESSEE—Anderson Co. - Oak Ridge, 2006 Karen Hughes s.n. (TENN 61260). TEXAS—Newton Co. - off St. Hwy. 87, 1.6 km N of Bleakwood, 11.vii.2000 David P. Lewis 6334 (RET 354-7); Bleakwood, Co. Rd. 3062, Lewis prop. [30º42.509’ N/ 93º49.630’ W], 24.ix.2000 David P. Lewis 6357 (RET 354-8). WEST VIRGINIA—Pocahontas Co. - Monongahela Nat. For., 28.viii.1977 S. L. Stephenson 215 (FWVA as "A. caesarea"). discussion The subhymenium is structured like that in A. caesareoides and other taxa of Amanita stirps Hemibapha (Tulloss 1998 and here). Contrary to the protolog of A. tullossii, material presented by its authors under that name also has this characteristic subhymenium and, in fact, must be included in A. jacksonii. The most similar taxon to A. jacksonii is A. caesareoides of eastern Asia. The latter's spores are smaller and proportionally slightly broader, on average. ? ?add data here?? D. T. Jenkins (who treated the present species as "A. caesarea (Scop.:Fr.) Pers.") 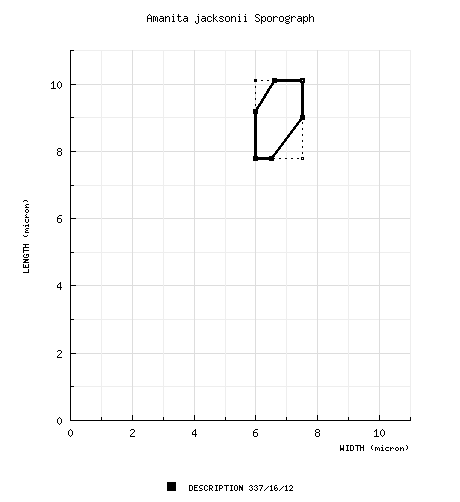 gives dimensions of 7.8 - 9.4 × 5.5 - 6.7 µm with Q = 1.37 - 1.57 and a Q’ value of 1.47; but he doesn’t indicate what material he examined to obtain these data. His data on distribution is limited to eastern states of the U.S.A. Since there are other, undescribed species of section Hemibapha in this region with spores narrower than those of A. jacksonii, it is possible that Jenkins mixed data of several taxa. When examined under Nomarski diffraction contrast about one-half of the spores seen in mounts of lamella sections from Tulloss 8-16-81-H seemed to have a spore wall like those of the crassospores of A. morenoi Raithelh. and A. pseudospreta Raithelh. as reported by Tulloss & Halling (1997). Tulloss 8-18-86-D was dried just as sporulation was beginning; there are a number of 4-sterigmate basidia; but less than 10 spores were seen in two mounts; and these lacked contents. Tulloss 8-18-86-D consists of immature material. Despite apparently complete expansion of the pileus, Tulloss 7-16-84-SSR-A lacks spores on its lamella. The description of the subhymenial base is derived from Tulloss 8-18-86-D; the description of the mature subhymenium, from Tulloss 8-16-81-H. This species is enjoyed by eastern gray squirrels (?) to the extent that, in some regions where the species is plentiful, it is difficult to find a specimen that hasn’t been eaten at least in part (Allein Stanley, pers. comm.). Humans eat the mushroom throughout its range. In Hidalgo, it was reportedly called "nonacatl"; but this simply means "mushroom" according to Guzmán (1997). Guzmán cites "tecomate de encino" as applying specifically to A. jacksonii. The immature specimen RET 393-6 was identified by site in the field and by nrITS sequence. photo RET - (1-2) Schenectady County, New York, U.S.A.
(4) Day Pond State Park, New London County, Connecticut, U.S.A.
Patrick G. Harvey - (3) Hawn State Park, west of Ste. Genevieve, Ste. 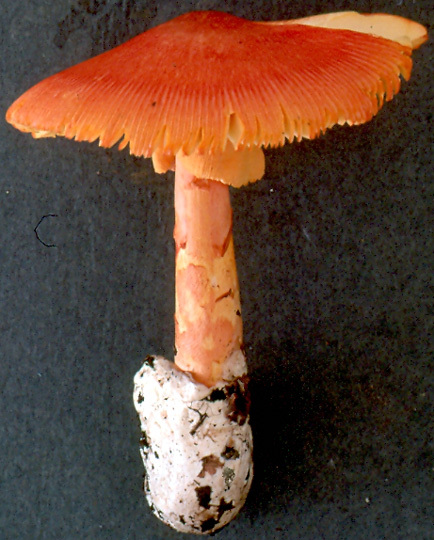 Genevieve County, Missouri, U.S.A.
provisionally identified as: Amanita jacksonii Pomerl. select a collection to review/add spore measurements..#702015. R. E. Tulloss, #7-31-99-A=>ATBI FU-0223, U.S.A., NORTH CAROLINA, Haywoo..#702016. G. Sheine, #s.n.=>ATBI FU-0150, U.S.A., NORTH CAROLINA, Haywood Co., Gr..#702017. E. Rothberger, #s.n.=>ATBI FU-0223, U.S.A., NORTH CAROLINA, Haywood Co...#702018. Karen Hughes, #s.n., U.S.A., TENNESSEE, Anderson Co., Oak Ridge#702019. David P. Lewis, #6334, U.S.A., TEXAS, Newton Co., off State Highway 87,..#702020. David P. Lewis, #6357=>30º42.509’ N/ 93º49.630’ W, U.S.A., TEXAS,..#702021. S. L. Stephenson, #215, U.S.A., WEST VIRGINIA, Pocahontas Co., Monongah..#766868. Djerba Goldfinger, #s.n.=>Tulloss 9-4-11-L, U.S.A., CONNECTICUT, Middle..#766869. Jeanne Jones, #s.n.=>RET 9-25-99-O, U.S.A., CONNECTICUT, New London Co...#766870. Jura Strimaitis, #s.n.=>Tulloss 8-31-97-B, U.S.A., CONNECTICUT, Tolland..#766871. Charlotte Carlson, #s.n.=>Tulloss 8-11-00-A, U.S.A., CONNECTICUT, Unkn...#766872. Ralph Cox, #s.n.=>Tulloss 8-11-00-E, U.S.A., CONNECTICUT, Unkn. Co., No..#766873. Stephen Russell, #s.n.=>mushroomobserver # 109414#766874. S. S. Ristich, #s.n.=>Tulloss 7-16-85-SSR-A, U.S.A., MAINE, Unkn. co., ..#766875. M. A. King & R. E. Tulloss, #8-16-81-H, U.S.A., MASSACHUSETTS, Franklin..#766876. Patrick G. Harvey, #s.n., U.S.A., MISSOURI, Ste. Genevieve Co., W of St..#766877. Mariaville, M. A. King, J. & W. Somers & R. E. Tulloss, #s.n.=>Tulloss ..#766878. Mariaville, M. A. King, J. & W. Somers & R. E. Tulloss, #s.n.=>Tulloss ..#766879. participant, #NEMF1994 s.n.=>Tulloss 8-20-94-D, U.S.A., NEW YORK, Ulste..#766880. Sandy Sheine, #s.n., U.S.A., NEW YORK, Warren Co., Warrensburg, Pack Fo..#766881. Sandy Sheine, #s.n., U.S.A., NEW YORK, Warren Co., Warrensburg, Pack Fo..#766935. David Wasiliewski, #s.n., U.S.A., PENNSYLVANIA, Carbon Co., Hickory Ru..#766936. #Erie, U.S.A., PENNSYLVANIA, Erie Co., Erie#805984. David P. Lewis, #6334, U.S.A., TEXAS, Newton Co., off State Highway 8..#805985. David P. Lewis, #6357=>30º42.509’ N/ 93º49.630’ W, U.S.A., TEXAS,..#805993. Charlotte Carlson s.n., #s.n.=>Tulloss 8-11-00-A, U.S.A., CONNECTICUT,..#805994. Ralph Cox, #s.n.=>Tulloss 8-11-00-E, U.S.A., CONNECTICUT, Unkn. Co., ..#806021. Ralph Cox, #s.n.=>Tulloss 8-11-00-E, U.S.A., CONNECTICUT, > Unkn. C..#806044. Djerba Goldfinger, #s.n.=>Tulloss 9-4-11-L, U.S.A., CONNECTICUT, Middl..#806070. Arturo Estrada Torres, #s.n.=>Tulloss 7-18-96-A, MÉXICO, HIDALGO, Mpio..#806071. Djerba Goldfinger, #s.n.=>Tulloss 9-4-11-L, U.S.A., CONNECTICUT, Middl..#806072. Jeanne Jones, #s.n.=>RET 9-25-99-O, U.S.A., CONNECTICUT, New London Co..#806073. Jura Strimaitis, #s.n.=>Tulloss 8-31-97-B, U.S.A., CONNECTICUT, Tollan..#806076. Stephen Russell s.n. , #s.n.=>mushroomobserver # 109414#806079. Patrick G. Harvey, #s.n., U.S.A., MISSOURI, Ste. Genevieve Co., W of St..#806085. R. E. Tulloss, #7-31-99-A=>ATBI FU-0223, U.S.A., NORTH CAROLINA, Haywo..#806086. G. Sheine, #s.n.=>ATBI FU-0150, U.S.A., NORTH CAROLINA, Haywood Co., G..#806087. E. Rothberger, #s.n.=>ATBI FU-0223, U.S.A., NORTH CAROLINA, Haywood Co..#806088. David Wasiliewski, #s.n.=>mushroomobserver # 105177#806089. "A. J." s.n. , #s.n.=>mushroomobserver # 138694#806090. D. Wasiliewski, #s.n.=>mushroomobserver # 140111#808414. R. Pomerleau, #s.n., CANADA, QUÉBEC, Région Capitale-Nationale, Québ..#808415. R. Pomerleau, #s.n., CANADA, QUÉBEC, Région Capitale-Nationale, ca. Q..#808416. Arturo Estrada Torres, #s.n.=>Tulloss 7-18-96-A, MÉXICO, HIDALGO, Mpio..#808417. Djerba Goldfinger, #s.n.=>Tulloss 9-4-11-L, U.S.A., CONNECTICUT, Middl..#808418. Jeanne Jones, #s.n.=>RET 9-25-99-O, U.S.A., CONNECTICUT, New London Co..#808419. Jura Strimaitis, #s.n.=>Tulloss 8-31-97-B, U.S.A., CONNECTICUT, Tollan..#808420. Charlotte Carlson s.n., #s.n.=>Tulloss 8-11-00-A, U.S.A., CONNECTICUT,..#808421. Ralph Cox, #s.n.=>Tulloss 8-11-00-E, U.S.A., CONNECTICUT, Unkn. Co., N..#808422. Stephen Russell s.n. , #s.n.=>mushroomobserver # 109414#808423. S. S. Ristich, #s.n.=>Tulloss 7-16-85-SSR-A, U.S.A., MAINE, Unkn. co.,..#808424. M. A. King & R. E. Tulloss, #8-16-81-H, U.S.A., MASSACHUSETTS, Frankli..#808425. Patrick G. Harvey, #s.n., U.S.A., MISSOURI, Ste. Genevieve Co., W of St..#808426. Mariaville, M. A. King, J. & W. Somers & R. E. Tulloss , #s.n.=>Tullo..#808427. Mariaville, M. A. King, J. & W. Somers & R. E. Tulloss , #s.n.=>Tullo..#808428. participant, #NEMF1994 s.n.=>Tulloss 8-20-94-D, U.S.A., NEW YORK, Ulst..#808429. Sandy Sheine, #s.n., U.S.A., NEW YORK, Warren Co., Warrensburg, Pack ..#808430. Sandy Sheine , #s.n., U.S.A., NEW YORK, Warren Co., Warrensburg, Pack..#808431. R. E. Tulloss, #7-31-99-A=>ATBI FU-0223, U.S.A., NORTH CAROLINA, Haywo..#808432. G. Sheine, #s.n.=>ATBI FU-0150, U.S.A., NORTH CAROLINA, Haywood Co., G..#808433. E. Rothberger, #s.n.=>ATBI FU-0223, U.S.A., NORTH CAROLINA, Haywood Co..#808434. David Wasiliewski s.n. , #s.n.=>mushroomobserver # 105177#808435. "A. J." s.n. , #s.n.=>mushroomobserver # 138694#808436. D. Wasiliewski, #s.n.=>mushroomobserver # 140111#808437. Karen Hughes s.n. , #s.n., U.S.A., TENNESSEE, Anderson Co., Oak Ridge,..#808438. David P. Lewis, #6334, U.S.A., TEXAS, Newton Co., off State Highway 8..#808439. David P. Lewis, #6357=>30º42.509’ N/ 93º49.630’ W, U.S.A., TEXAS,..#808440. S. L. Stephenson, #215, U.S.A., WEST VIRGINIA, Pocahontas Co., Monong..